One of the most controversial ballot measures in last week’s elections was Proposition 37 – the initiative that would require labeling on foods containing Genetically-Modified Organisms (GMOs). I voted “Yes” on the measure, but consumer fears of higher food prices in today’s economy, influenced by the huge monetary backing against the proposition by food/chemical giant Monsanto and other companies, helped it to go down, garnering 47.1% of the “Yes” vote. The one silver lining in the issue is that despite the loss of Prop 37 – the issue of GMOs and “The Right To Know” exactly what is in our food is now more or less a household topic. With GMOs proven to be potentially harmful, most people would have voted “Yes” if not for the food price inflation scare (61 countries already have GMO labeling, and food price increases are hardly measurable). In the meantime, some advocates are pushing for federal legislation requiring food labeling, and the increased profile of Prop 37 here in California would no doubt influence that. And while there are no labels, we do have access to technology where, though information and awareness, we can “self-label” foods via websites or social media, vote with our pocketbooks and support companies that market non-GMO food products. Tuesdays, 2 p.m. – 7 p.m. If you’ve never shopped at a farmer’s market before, don’t be put off by the prices. Yes, they’re a little higher than at the supermarket, but the quality is much, much better. Compare a supermarket tomato to a farmer’s market tomato. The taste is beyond comparison. 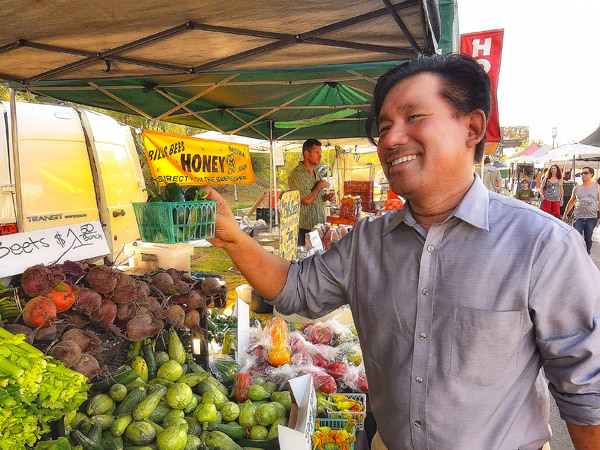 Some farmer’s markets, like East Hollywood, accept EBT cards and even offer bonuses for every $5 purchased, so low-income customers can enjoy the benefits and access the same of fresh, organic, GMO-free produce. And if you’re a regular enough customer, some of the vendors will give you a discount. You’re also likely to get discounts at the end of the day when they would rather sell inventory for cheap than have to pack it all up. And sometimes, the vendors will give away that last pack of strawberries or that last potato to you for free. Community-Supported Agriculture (CSAs), Community Gardens and urban farming on your own property are also great options for communities to have access to quality, real fruits and vegetables. Labels or not, as awareness of GMOs grow, no doubt more people will be seeking these options for the food they eat.